Sell My Deltona House Fast! No Realtor Commission. Fast, Fair, and Free Cash Offers. Any price range or situation! I want to sell my house in Deltona fast. I don’t want to pay thousands to realtors or make expensive repairs. I’m looking for an easy home sale for a FAIR PRICE. 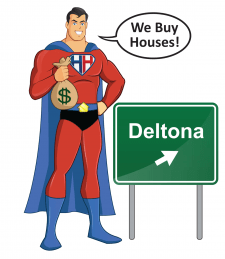 House Heroes is Deltona’s number one cash home buyer. We buy houses “as-is” – you make no repairs. House Heroes guarantees fair cash offers and never charging a dime in fees. Sell fast? Need repairs? We get the job done. Hiring a real estate agent is never this easy. Realtors expect you to renovate, put up online listing, deal with open houses, and put their sign on the front lawn. On top of that, you pay upwards of six percent commission. House Heroes makes selling a Deltona house easy. Don’t make repairs, pay realtors, or wait months. Click the button below to learn how our “3 Step Home Buying Process” works. House Heroes makes Deltona home sales easy. Step One. Contact Us. Reach out to us by calling (954) 676-1846 or filling in our simple form by >>clicking here<<. We gather some info about the property. Step Two. Get My Fair Offer. We make you a fair cash offer based on local Deltona comps in under 24-hours. Our offers are no obligation, no hassle, and “as-is”. Step Three. Fast Cash Closing. Since House Heroes has cash reserves – we can buy fast. No needs for mortgage delays or headaches. You never are charged fees or commission. Debating hiring a realtor in Deltona? Agents charge commission even if you find the buyer. Get a price lower than promised? They still collect. It’s a slow and time-consuming. When you sell to House Heroes, you get cash in your pocket fast and never waste time or money on realtors or repairs. Want a fair offer for your Deltona house? Wondering how much we can pay? Our offers are cash, no obligation, and as-is. You pay zero real estate agent commission. Just click the button below for your offer! We’ve been buying property in Deltona for over 5 years. We help homeowners sell in all sorts of situations: sell fast, major renovations, inherited house, relocation, foreclosure, eviction, late taxes. We’ve been buying houses in Deltona since 2013. The House Heroes Team strives for total client satisfaction. Click the “About Us” button below to get more info about our company! Deltona, per the City-Data page, has a 90,139 population, median age 41, estimated household income $48,161, per capita income $20,326, estimated condo or house value $129,100, and median rents $1,097. Recent data demonstrates a $180,000 median listing price, $175,000 median closing price, 821 active home sales, and 65 homes for rent. Deltona is in Volusia County with zip codes 32725, 32728, 32738, 32739, 32763, and 32764. Local areas include Autumn Woods, Coventry, Crystal Lake Estates, Deltona Lakes, Deltona Woods, Edgewater Condominiums Sweetgum Woods, Glen Abbey, Saxon Ridge, Summerfield Farms, Timbercrest, and Treeshore. House Heroes makes it easy to “sell my house in Deltona” fast.